'Escape at Dannemora': Did Richard Matt Really Have a Photo of Hillary Clinton in His Jail Cell? ‘Escape at Dannemora': Did Richard Matt Really Have a Photo of Hillary Clinton in His Jail Cell? Brett Johnson and Michael Tolkin never strayed too far from the real-life events for Showtime’s “Escape at Dannemora,” which tells the story of Richard Matt and David Sweat’s breakout from a New York state prison in 2015. 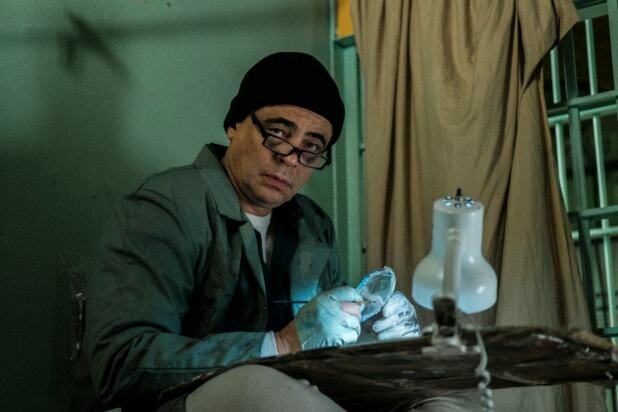 But a couple of scenes in the second episode of the series shows Matt (Benicio del Toro) painting a portrait of then-presidential hopeful Hillary Clinton, complete with a photo of her in his jail cell. So, we asked Johnson and Tolkin if that was indeed true. Did Matt, who had a hobby of painting celebrities and political figures while incarcerated, actually have a photo of Clinton in his cell? “It’s not a real story,” said Johnson, on whether or not Matt actually had a photo of the 2016 presidential runner-up. “But, it is true [that he painted a portrait of her in jail].” Basically, Johnson and Tolkin wanted to illustrate just how he would have been able to do his artwork. Tolkin and Johnson pointed to a story on Syracuse-based news channel, CNY, which interview with John Mulligan, who said he was a former inmate of Matt’s. He told CNY that he received paintings from Matt after Mulligan got out of prison, and these paintings included the likes of Clinton, Barack Obama, Bill Clinton, Oprah Winfrey, and even George Clooney and Julia Roberts. “If you did a fictional story and said this is a murderer and he paints, who would think that he’s going to be painting Julia Roberts,” said Johnson.